The R&S®ELEKTRA EMI test software supports EMI measurements performed during development with EMI measuring receivers and spectrum analyzers from Rohde & Schwarz. Test templates – including relevant limit lines and transducer factors – simplify configuration. Tried-and-tested measuring procedures provide reliable measurements. 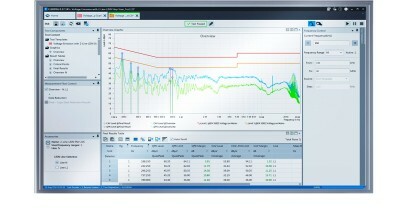 The software helps users to archive and document measurement results. The predefined test templates contain receiver settings, describe the test setup and can be easily modified. The software includes a collection of relevant limit lines from commercial and military standards as well as the transducer factors for many antennas, artificial mains networks and other test sensors. The dashboard enables fast access to all essential elements such as tests, templates, instruments and settings. Frequently used items are added as a favorite to the main page in order to access them directly. A block diagram shows the test setup cabling and makes it easy to call up the setting parameters for the individual devices. R&S®ELEKTRA performs automated disturbance measurements with the R&S®ESCI, R&S®ESPI, R&S®ESL, R&S®ESR, R&S®ESU, R&S®ESRP and R&S®ESW test receivers, as well as the R&S®FSL, R&S®FSV and R&S®FSW signal and spectrum analyzers. R&S®ELEKTRA automatically switches over artificial main networks with several phases in line with relevant standards, e.g. when measuring conducted disturbances. The software saves all measured values for data reduction and further analysis. CISPR14-1 allows TEM waveguides even for compliant measurements of e.g. battery-operated electric tools. R&S®ELEKTRA converts measurement results from x-, yand z-axis from the EUT in the waveguide to results equivalent to those obtained from an open area test site. Automated analysis of the measured spectrum detects limit violations that are sorted according to frequency subranges. The software optionally generates a list of critical frequencies with the highest disturbance levels relative to the limit line. If necessary, the user adds frequencies that are taken into account during the final measurement or removes ambient disturbance signals from the list. Versatile marker functions help to identify critical frequencies. The final part of the measurement is performed using the standard-compliant detector. The interactive measurement enables users to determine the frequencies with the highest disturbance levels more precisely in order to reliably detect drifting signals, for example. Alternatively, the final measurement runs automatically, which is ideal for stable disturbance signals. If the preview measurement results have been achieved with the standard-compliant detector and the time-saving time domain scan, for example, a final measurement is not needed. In addition to measurement results, instrument settings and test setup configuration must also be included in the complete documentation of a measurement. Users can add additional components such as text or photos (e.g. of the test setup) and check the report in the preview. It is also possible to print or save test reports in PDF format.